The Cougar is located in West and South North America and much of South America. This scrollsaw pattern makes a beautiful finished intarsia piece. The pattern was designed to be cut out in two different ways: with the background and oval or without. The designer also gives you tips to help you complete the project. If you choose to complete the head only, there are 32 pieces, but if you choose to make the oval and background there are 41 pieces. Great plan, easy to follow pattern. 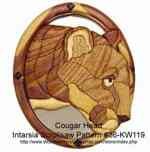 Cierny Sery Dog Yard Art Woodworking Pattern.